My experience as a UN Volunteer in Afghanistan stands out in my memory as an extraordinary one, on a professional and personal level. I am grateful for the opportunity given to me to serve the electoral process in Afghanistan, to discover the charm and hospitality of the Afghan people, and the immense beauty its land offers. It is also there that I experienced true friendship and great loss. 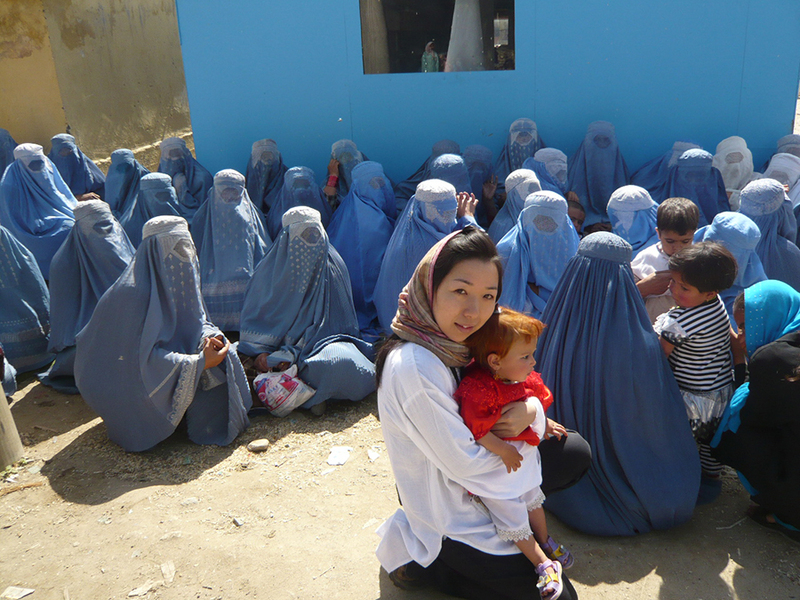 Atsuko Hirakawa in front of the Independent Election Commission in Parwan, where Afghan women wait to receive a Voter’s ID card to vote in the Presidential and Provincial Council elections. When I completed my Master’s degree in the United Kingdom, I found myself back at UN headquarters to seek advice from former bosses and senior colleagues, and it was during that time that I learned about the UN Volunteers programme. I feel privileged to have had the opportunity to serve as a UN Volunteer and for the United Nations, where it is possible to positively influence people’s lives, no matter how small the contribution or how long it takes. I am grateful to all who have supported me along the way. My first assignment as a UN Volunteer was with UNDP in Sierra Leone, during which, as District Training/Voter Education Advisor, I supported the National Electoral Commission to plan and implement the 2007 Presidential and Parliamentary elections. It was only five years after the ceasefire agreement. As a young UN Volunteer, it was a life-changing experience to work with, and for, Sierra Leoneans, who had survived a decade-long civil war. I had never in my life seen people so eager to vote, hopeful for change. Voters queued in front of polling centers from 5am on elections day, resulting in over 70 per cent turnout. A new President was elected, and the election was commended as free, fair and credible. In 2009, I took on an assignment with the Enhancing Legal and Electoral Capacity for Tomorrow (ELECT) Project of UNDP in Afghanistan as UN Volunteer Public Outreach/Training Coordinator to support the Independent Electoral Commission. The Provincial Electoral Officer of Parwan province (pictured in the first photo above, left), where I was assigned, and his staff welcomed me warmly. My first objective was to learn from them and adapt to their culture, to understand how I can contribute. What stunned me the most was the generous heart of the Afghans. They had suffered a history of war and poverty, yet they were the most kind and giving people I had ever met. I realized that it was these positive elements about Afghanistan, not the terrorist attacks often shown through media, that needed to be shared to the outside world. My role was to provide support and advice in planning and executing electoral operations, ranging from training polling staff and civic education (second photo above) to distribution and retrieval of electoral materials. I was particularly passionate for youth and women to take an active role. Another important task was coordination with the Afghan National Police and the Provincial Reconstruction Teams. With constant threats and dangers – including improvised explosive devices and suicide attacks – we were always on high alert. Before we had to relocate to Kabul for security reasons, six ELECT personnel were based in Kapisa, in a house surrounded by mountains. Curfew was 6pm. Always together, on the road, at the office and at home – close to 24/7 – and given the security context, we had no choice but to get along and look out for each other! And we did. This was one of my most memorable experiences. One week before the Presidential run-off, Bakhtar guesthouse in Kabul, which was home to many ELECT colleagues, came under attack by insurgents, taking the lives of five members of the UN family, including two UN Volunteers: Yah-Lydia Wonyene (Liberia), who was part of the Kapisa team, and Jossie Esto (Philippines). It was the worst day of my life. With the UNV family, we mourned the death of our two UN Volunteers. Not knowing what was going to happen, we hung tight as a team. But with further threats targeting elections staff, we had to leave the country. I left with great sorrow and a sense of incompleteness on the part of my mission in Afghanistan. The experience changed my life forever, professionally and personally. But after some struggle, it only reinforced my determination to keep fighting for peace. The following year, an opportunity came to return to Afghanistan through UNDP to support the organization of the Wolesi Jirga elections. I was entrusted by my supervisors, and my service was requested by Independent Election Commission colleagues, so this became my most honorable mission. My heart froze, but I knew what I had to do. The security conditions were extremely difficult. But I looked back at 2009, and realized that my experience was even more meaningful because I was a UN Volunteer, where my skills and commitment to accompany the Afghan people were acknowledged. I also felt that we had the responsibility to carry on the spirit of our fallen colleagues. When I went back to Afghanistan and rejoined ELECT, I felt a sense of belonging. My next move took me to Haiti, which became my home for the following six years. The opportunity came through the Junior Professional Officer Programme sponsored by the Government of Japan to work as Programme Analyst for UNDP. The country had embarked on a journey to recover from the devastating earthquake. Subsequently, I became Project Management/Gender Specialist for a project to support what turned out to be an extremely complex electoral process, lasting years. I have always believed that those who are in the position to do so have the moral duty to help others. Although the path has been bumpy – often with seemingly impossible challenges – I have learned that there is always a solution.